1) Antique Photo Album - A gift of sorts, this album came from someone I was just having a conversation with about how sad it is that people always take the pictures out of old albums to sell them separately. This album, however, has the original pictures in it. I put them mostly around the 1880's and 1890's plus maybe a couple that are older, judging by the clothes. And besides the wonderful fact that the pictures are in, this album is simply a beautiful little book. 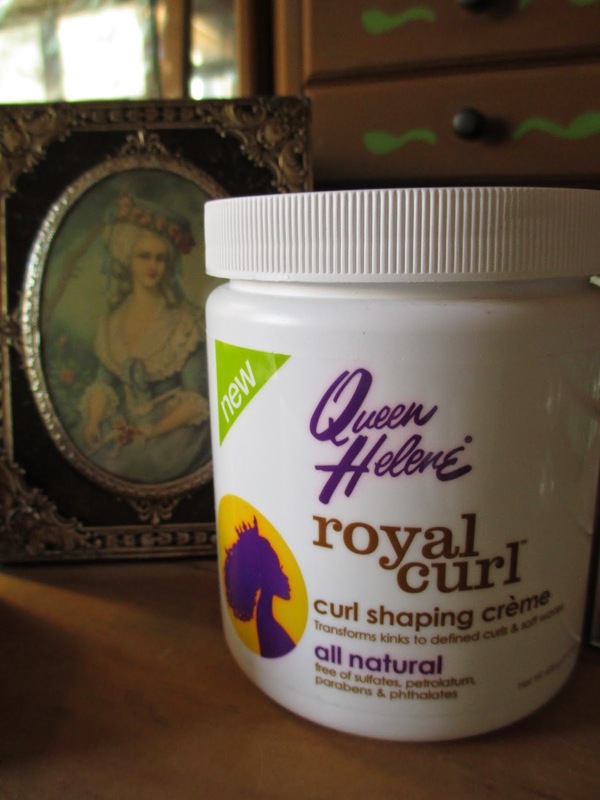 2) Queen Helene Royal Curl - I used to use the Hair Milk from Carol's Daughter, but I can't find it in store anymore and didn't really want to have to order online--I tried out the Hair Pudding, but it didn't curl my hair as much. Then I found this container at Whole Foods; it's less than half the price of Carol's Daughter's products. And even though the jelly-like texture takes a little getting used to, it works fairly well for my half-wavy hair. It helps enhance curls a tad and keep things tame. 3) River Song's Journal(s) - We all have bad shipping experiences at some point, I suppose. Quite some time ago, I decided that the deluxe edition of River Song's journal was the one Doctor Who merch item I'd like to get. But I had such trouble with shipping. Such trouble. So, as a consolation to myself, I have also ended up with the regular edition. The deluxe journal is very thick and feels wonderful to hold--although I'm still not quite sure what to make of the coded page. 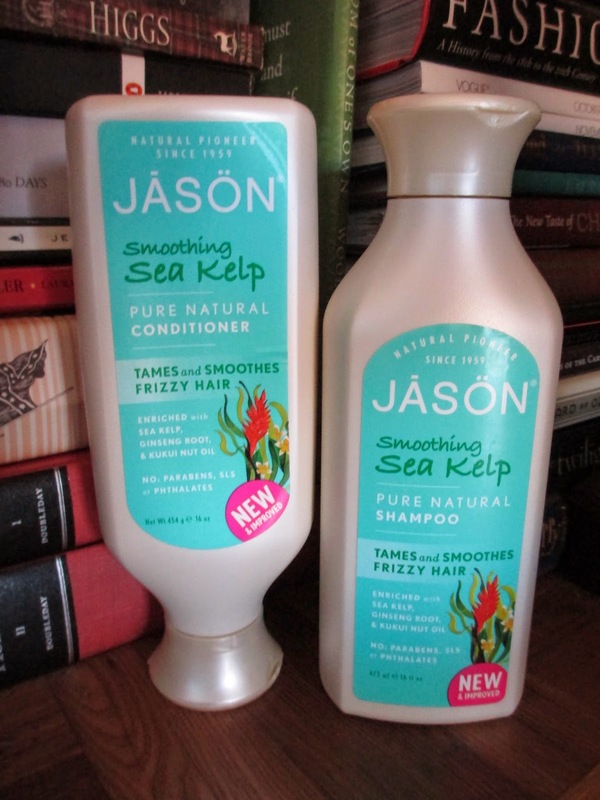 4) Jason Smoothing Sea Kelp Shampoo & Conditioner - Let's see, so I was using Avalon Organics for a few years, then Aveda for a couple of years. Now I've switched again, for now, at least. Originally I just picked out this particular shampoo from Jason because I was avoiding formulas designed for volume and other such things I need no help in, but it turns out that it does keep the frizz down somewhat. An added bonus. 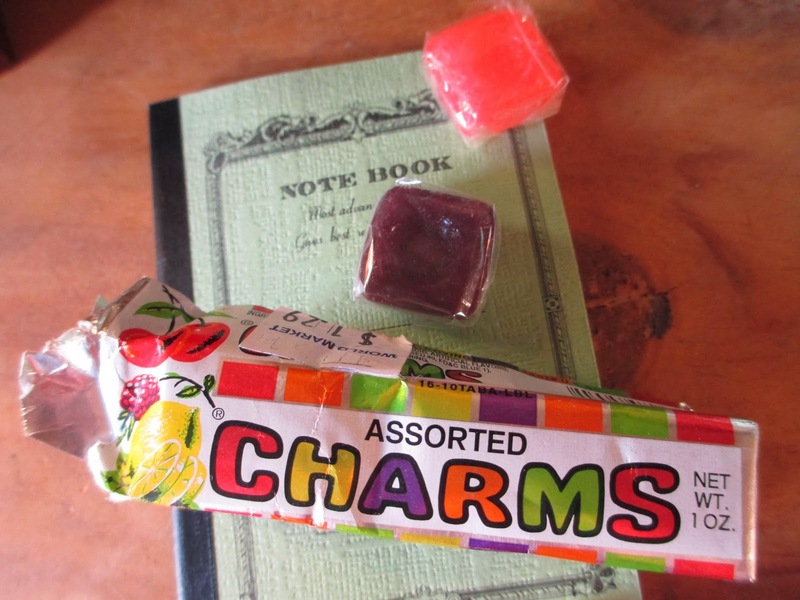 5) Charms Candies - I suppose they're basically just regular, fruit-flavored hard candies, but I'm really enjoying this random find from World Market. They're clear colors, like rectangles of glass, all individually wrapped. Get me more, please? 6) World Market Cuff Bracelet - I try not to get too much from their jewelry section anymore, but I had liked this bracelet before and it was on sale, so here it is. The pattern reminds me of leaves and vines. 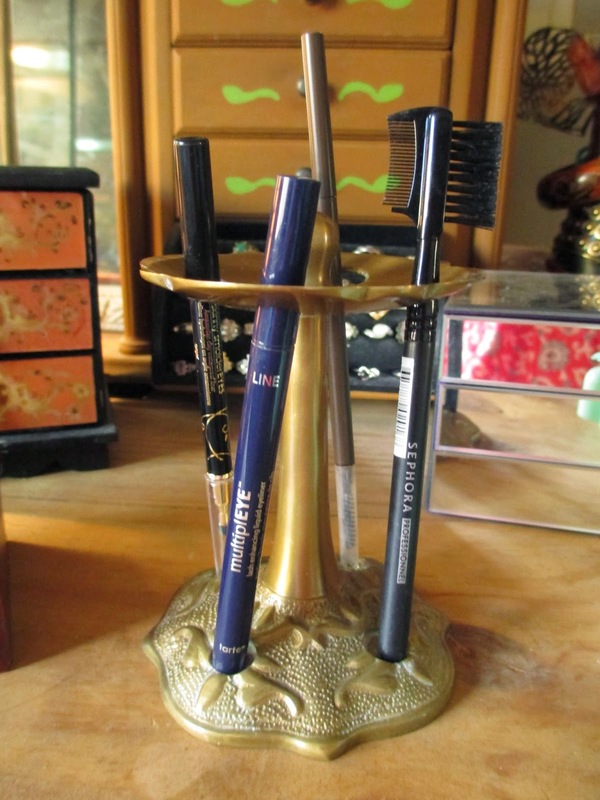 7) Brass Makeup Holder - For $3.50 at an antique store, I thought this brass holder would be perfect for makeup brushes and eyeliner and such. I've also placed another couple of smaller items in the bowl space on top. We were joking that if it were at Anthropologie, it would have been $48 and not even at least brass. 8) Copper Bracelet - Having been thinking a while on getting a copper bracelet (you do seem to find them in many shops around here), I finally settled on this one. The floral texture reminds me of something you might find carved into a piece of leather. And at $9, it's price is less than the World Market bracelet--even though this one is copper instead of some random metal. 9) Eucalyptus Oil - Don't buy air freshener. 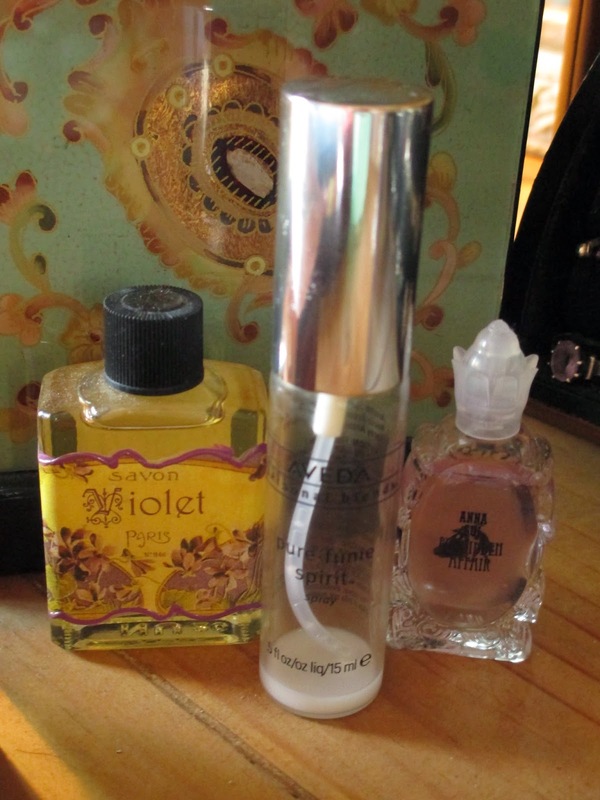 Buy essential oils, whatever scent you like, and mix them into water. I've been putting eucalyptus oil into this old bottle from Aveda (in the middle) and spraying it as a refreshing scent for night or day. 10) Pearl Bead Necklaces - Four strands of these beads for, I think, around $3, at an antique store. They're nice little trinkets for layering, whether to wear them all together or just one or two. I latest wore just one strand with my (small) dinosaur necklace and large white cameo that I'd clipped onto a colorful beaded necklace.